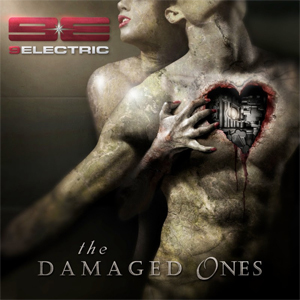 LA-based rockers 9ELECTRIC recently released their slamming debut album The Damaged Ones via Another Century Records. The eclectic mix of hard rock and ballads, doused with copious amounts of synth will make you shamelessly want to dance and headbang all at the same time. Think STATIC X meets BILLY IDOL but with even more energy. There have been other bands in the past that have walked that line of electronic music and hard rock, but this album is a habitual line-stepper; completely blending the genres of hard rock, EDM, and even metal. I have been fortunate enough to catch 9ELECTRIC doing their thing live a few times and in anticipation of this record dropping I had been hoping that they would be able to capture that energy with the album. “New God” – probably the heaviest song on the record, is a great example of doing just that. It is up-tempo and the chorus just sticks. If it hasn’t already, the song “Naked” will be heard in strip clubs across the country. Vocalist Ron “Thunderwood” Underwood really paints that picture well for the listeners. The album continues to throw pounding rhythms and addictive hooks with notable songs such as “Take It Away” and “Lies” which, in a way, reminds me of the song “Time Bomb” that the band released back in 2011. Don’t let the title track fool you; “The Damaged Ones”, which is also the album’s opening track is a little subdued and drowsy when compared to the balance of the material. It is a good song, but all things are relative, right? – and that song can be a tad misleading. Once the record concludes, the party dies down and the strippers go home, you are left feeling great; tired, but great. It is a stellar debut and the beginning of a promising career for 9ELECTRIC. Pick up this record and go see them live. Grab your copy of The Damaged Ones in the KNAC.COM More Store right HERE.